Don't worry, I haven't given up blogging for Lent, though the season and the lead-up to Easter can be pretty hectic. At Mt. Bethel, we've just started a new sermon series entitled "24 Hours That Changed the World" based on Adam Hamilton's book by the same title. It's proving to be an intriguing look into the last day of Jesus life, from his time in the upper room with his closest friends to his dying moments, alone on the cross. Last Sunday we kicked off the series by looking at the Last Supper. This was a traditional Passover Seder meal that Jesus and his followers shared. It was, and is, a celebration of God's providence for his people and how He carried them out of Egypt and gave them freedom. Jesus, that night, enjoyed this meal with his disciples and transformed this ritualistic meal into the Eucharist (Holy Communion) that we celebrate today. Jeremiah 31: 31-34 tells us about how the Israelites broke the covenant that God made with them in the Exodus and how there will come a day that God makes a new covenant with his people, one that will last and will be on the hearts of each person. In his last meal on earth, Jesus instituted this new covenant with all of humanity. He broke bread and offered a cup, both symbolic of his sacrifice on the cross and the medium by which God would draw every man, woman, and child to him. Interesting about this whole night is that at one point, Jesus declared that he would be betrayed. Of course, each of the disciples denied it, but Jesus knew that Judas would sell him out, that Peter would deny him three times, and that the other 10 disciples would desert him, leaving him to endure suffering and death all alone. I'm sure that Jesus also knew that every person that ever chose to follow him, for that matter, every person who ever lived, would do just the same. Each of us, at some point denies, deserts, and betrays Christ in word or deed. Despite Jesus' knowledge of this, he went on to break bread with these men. He went on to spend his last hours with those who would fall short. He went on to wash their feet, to pray with them in the garden, and even to recieve a kiss from Judas, the one who would trade his life for 30 pieces of silver. If anyone needs a definition of grace, this is it. Out of love, despite ourselves, God loves us and sacrifices everything for us. I'm grateful for that grace. I'm also led to reflect on my own gracefulness. Ministry is hard. The old rule is that polite company never discusses religion or politics. Well, when you're in ministry, faith is a constant conversation and sometimes politics enter the conversation as well. People have differing opinions. Feelings get hurt. People choose sides. Lines are drawn. I have served four churches in the last 12 years. I can revisit those congregations and tell you who has stepped on the back of my head rather than helping me up and I can admit that I've harbored some unhealthy resentment toward some people. Revenge is never far from the mind (or the heart) when you've been hurt, and I've had to learn to temper my own feelings when I come into conflict with others. I ask myself though, how much Christlike grace do I show others when I've been denied, deserted, or betrayed? Though I may literally turn the other cheek by not retaliating and I may take an outwardly pacifist approach to these conflicts, what's going on inside? I'm guilty of having set limitations on how much I would do for someone who has hurt me. I'm guilty of allowing my feelings to taint any future relationship I may have with those people. The very act of harboring those ill feelings is a betrayal of what Christ has done for me and for others. It hinders my personal life and it hinders my effectiveness to minister to others. For Lent, my prayer is that I may be as grace-filled as Christ. If we all learned to be gracious, how different would the world be? Last year, my church's leadership worked to discern God's vision for who we should be and what we should be busy doing. Since high school, I've learned about visioning, ready about it, helped develop some visions, studied the visions of others, and now led the discernment of that vision for a church. It occurred to me last week how much visioning is like receiving an organ transplant. Let me explain. Every church has a heart. Maybe its a heart for the community and for reaching the lost for Christ - great. Maybe it's a dysfunctional heart that thinks selfishly and doesn't respond to the needs of those around, much less seeks the heart of God. 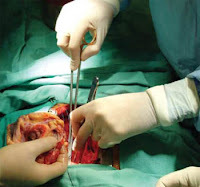 In many cases, our churches need a heart transplant. As with any living being, this transplant comes with some distinct advantages. Primarily, you have the health of the church. We know that if you are following the will of God and hearing the call of the Holy Spirit, you will be successful, at least in God's terms. This is what a healthy congregation looks like. Also, much like a transplant, there are side effects. When you place a foreign heart into a human being or any other animal, it's disruptive to the rest of the body's systems. The body will automatically realize that this is something that doesn't belong and there is a period of time that you have to wait to see if the body will accept it or reject it. If it accepts it, then you will regain health and add to your longevity. If it rejects the new heart, the results could be catastrophic, from needing more major work or even problems as extreme as death. When this new vision was transplanted into our church in the fall, we had a period of time that we had to monitor that transplant to see if it would be accepted. The good news is that its February and the patient is doing well. Last week, as we fine-tuned our budget for this year (don't ask - we are running a little behind), I noticed that the overall budget hadn't changed much, but the individual line items have changed significantly from the way we minister to youth and children, all the way down to how we manage the office. Many new programs and ministries are being implemented BECAUSE of the vision and God is beginning to move us forward together. I'm so excited I can't stand it. Last night, our vision team met again to begin looking at some sweeping changes that could revolutionize our church. I won't tell you what they all are yet - the vision team needs to continue to pray and plan before we reveal anything. But I can tell you that God is doing something BIG. I've seen too many churches reject their transplanted vision and suffer for it. I thank God and I thank all the people who have spent time on their knees for the acceptance this new heart has received in this body. So what's our vision? "To be a spiritually alive church, sharing Christ's love through service to the community." A summer camp program for the children in our community is being developed. We are putting the pieces together to create an all-day, six-week ministry during the summer that will give parents a safe place to put their kids during weekdays and provide the children with a place to learn and have fun during their summer. Hospitality Ministry - we are stepping up our hospitality efforts and finding new ways of connecting with visitors to our church. A Contemporary Service - this one is still in utero. As plans come to light, we'll share that with you. Worship Enhancement - thanks to the sanctuary heat going out in December/January, our people were exposed to worshipping with the aid of a video system. Now we are making plans to install a permanent system in our worship space. Communications - we are making plans to beef up our web presence as well as adding office capabilities to do more in-house printing and moving from a weekly bulletin to a monthly newsletter. A Mission Center - we are looking at the potential of changing our old education wing into some sort of mission/service center for the community. Not sure yet whether that will take shape as a food pantry, clothes closet, or something else, but we have the space and we know that we need to use it to benefit others. Mike Slaughter is one of my heroes. Over 30 years, he's had one appointment as a United Methodist Pastor - Ginghamsburg UMC in Tipp City, Ohio. He's done what many pastors dream of and that is to take a fledgling church and help it to realize its true potential in reaching others for the Kingdom of God. One of my biggest frustrations with the cultures of our church and our country is the mindlessness that we tend to approach things with. Almost daily, I get an email with numerous factual inaccuracies, listen to a minister preach the words of men rather than the Word of God, or spend time clearing up false gossip. Too many people slug their way through life sharing a single brain with thousands of other people, often using that single brain to complain about how our freedoms are being stripped away by the right or the left. As we continue our series on Primal with a week on what it means to love God with all our mind, Mark Batterson points out that most people have stopped living out of imagination and started living out of memory. "Like teenagers who don't know how much they don't know, we're so proud of our one-dimensional knowledge of the Creator and creation." The truth is that our brains have the capacity to learn constantly for the next 3 million lifetimes. We get lazy though and make excuses for why we're not constantly learning. As a Church, we've actually managed to propigate this problem. We've gone from being a place that people could explore life and faith and a leading place of learning to a group that protects the status quo and actually encourages groupthink. When we stifle creativity and progress, we lose the privilege of directing that creativity and progress in our culture. When we decide that the Kingdom has come and shall never change, our influence is lost in the lives of people who need our influence. Paul, in his trip to Athens, noticed at first that there were large numbers of idols (Acts 17: 16-28). 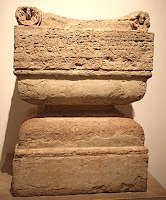 Among those was an altar with an inscription: TO AN UNKNOWN GOD. No wonder, in the presence of so many pagan influences, someone decided to become agnostic. The scholars of Athens (the center of education at the time) hadn't eliminated false religion from the area, probably because their perspective wasn't a spiritual one. Unfortunately, the local synagogue hadn't combatted false worship with any success either. What this tells me is that the synagogue passed the buck for learning to the philosophers and opted instead for being protectors of the status quo. Paul preached to reclaim that influence for the Athenians by pointing out the altar and saying, "Let me tell you who this unknown God is..."
How often are we guilty of defending the status quo at the cost of losing our influence in the lives of others? How many times have we fought over trivial things only to discredit ourselves with the people we should be witnessing to? As Paul was sharing the message of Christ in Athens, the philosophers that gathered around quickly dismissed Paul as a "babbler." Now, there is the fact that the message of God confounds human wisdom, but I believe this name calling went even further than that. I believe that this message challenged the status quo for the philosophers and threatened their own authority within the culture. If we, as members of the Church, desire to love God with all our minds, then perhaps we should look at what our true goals are (hint: see Matthew 28) and what we're doing to move toward that goal as well as what we're doing to hinder our own progress. Are we aspiring to a greater life, to the coming of God's Kingdom, or have we settled for what we have and feel like we have to defend what's left as it erodes under secular influence? I believe that if we aspire to greater life, to lifelong learning, and exploration of God's creation, we will draw a crowd and win influence because we will be the people that others want to be around. How badly do you want to spend this afternoon with someone who is dull and non-ambitious? How willing are you to take the advice of someone who has settled for a meager life over someone who has experienced the fullness of the life God has given them? God doesn't need to be unknown to the world. But in order for Him to be known, we must first know Him and then be able to help others meet Him.